(CNN) -- A stampede that occurred during a festival in Cambodia's capital city of Phnom Penh has killed 339 people, officials said Monday. 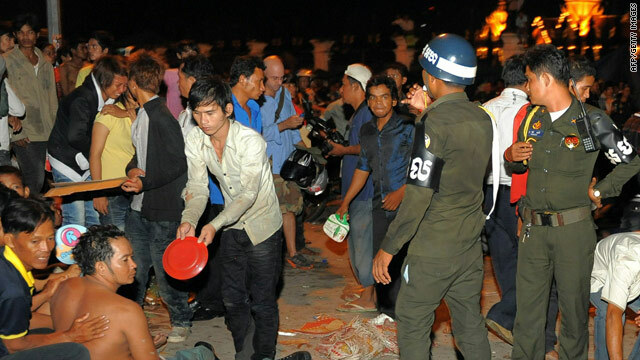 Another 329 people were injured in the crush, said Philip Bader, a news editor with the Phnom Penh Post, citing information given by Prime Minister Hun Sen in a televised address. Visalsok Nou, a Cambodian Embassy official in Washington, said more than 4 million people were attending the Water Festival when the stampede occurred. But other reports put the number at 2 million., said Steve Finch, a journalist with the Phnom Penh Post. The municipal police chief said that the stampede, which began around 10 p.m. (10 a.m. ET), likely occurred because a suspension bridge packed with people began to sway, creating panic, said Bader, who cited reports of people jumping from the bridge into the river below. Finch said police began firing water cannon onto a bridge to an island in the center of a river in an effort to get them to continue moving across the bridge. "That just caused complete and utter panic," he told CNN in a telephone interview. He said a number of people lost consciousness and fell into the water; some may have been electrocuted, he said. Finch cited witnesses as saying that the bridge was festooned with electric lights, which may have played a role in the electrocutions. The government denied anyone was electrocuted. But a doctor who declined to be identified publicly said the main cause of death was suffocation and electrocution. Police were among the dead, Finch said. Officers with the prime minister's security unit stood outside a hospital trying to help those arriving with injured people and to control the scene of chaos. In one case at a hospital, relatives of a woman who had been confirmed dead discovered she still had a pulse and she was taken into the emergency room. It was not clear whether she survived, Finch said. Video of the scene showed hundreds of shoes, clothing and other personal items littering the streets, the bridge and the underlying water near where the festival took place. Ambulances dropped off the injured at area hospitals and then sped away, video on Bayon Television showed. Outside one hospital, doctors stood trying to direct traffic so that ambulances and vehicles carrying injured were able to get through. Dozens of people could be seen laying on what appeared to be the waiting-room floor of a hospital. They were attached to intravenous lines connected to bags strung along wires suspended in the air. The prime minister ordered an inquiry into the cause of the day's events and declared Thursday a day of mourning. The three-day festival, which began Saturday, is held each November near the palace to honor a victory by Cambodian naval forces during the 12th-century reign of King Jayvarman VII, according to the country's tourism website. During the festival, which includes boat races, participants pray for a good rice harvest, enough rain and to celebrate the full moon, the site says.